We're back after a bit of a hiatus with a new episode digging into Ringo Starr's 1972 single, "Back Off Boogaloo." We talk about the music and lyrics, sample some covers (including a Czech one for Dave! ), and even get into a little disagreement about Ringo's brother-in-law, Joe Walsh. We're back now, so stay tuned for more episodes soon! In the first of an occasional series, we look at important gigs in the Beatles' career. This episode examines the Beatles' performances in late December 1962 at the Star Club in Hamburg, Germany. We discuss the set list, the sound of the group, place this gig into context, and discuss how important Hamburg was for the Beatles. Enjoy! In this episode, we explore some of the great (and interesting, of course) covers of George Harrison songs. We'll discuss covers by Harrison's friends like Harry Nilsson and Tom Petty, as well as many other lesser-known artists who pay tribute to George's music by recording his songs. Our first episode of 2019 is a review of the streaming version (2 disc) of Paul's Red Rose Speedway remaster and bonus tracks. We get into all the issues and songs with plenty of Paul histrionics, stoned tunes, some weird lyrics, and of course the big medley at the end of the album. Hope you enjoy the episode! For our final episode of 2018, go under the microscope once more with us as we examine Cream's 1968 song "Badge," co-written by Eric Clapton and... L'Angelo Mysterioso? Find out who that is, what we think the song means, what's happening in the music, and of course, you'll hear some unusual covers (including a non-English version). Thanks for your support in 2018, and we look forward to even more Beatle fun in 2019! In this bonus episode for the holidays, listen in as Dave interviews four different scholars who attended and presented along with him at the White Album conference in New Jersey in November. You will hear Dr. Kathryn Cox, Dr. Katie Kapurch, Dr. Gabe Lubell, and Aviv Kammay discuss all things White Album. Here it is! Our 2018 holiday gift guide to all things Beatles, as well as several non-Beatle releases of interest. We discuss all sorts of merchandise, from recordings to t-shirts. Enjoy! We discuss the tremendous six-CD/Blu-ray box set out now for the 50th anniversary of The Beatles (The White Album). We talk about the book, the CDs, the wonderful Esher Demos, as well as the look into the White Album sessions. A must have! Enjoy and feel free to write us at ivegotabeatlespodcast@hotmail.com. In this episode, we dissect the new Imagine: The Ultimate Collection box set from John Lennon, and discuss the packaging, content, and fascinating alternate versions of Imagine tunes found on this excellent collection. A great deal both in terms of content and price! Let us know what you think on our Facebook page, Twitter, or by email (ivegotabeatlespodcast@hotmail.com). In this episode, we conclude our look at Apple artists compiled on the 2010 album Come And Get It: The Best of Apple Records. We've had fun examining the careers and music of famous Apple alumni like Badfinger, Mary Hopkin, and James Taylor in full episodes, but what about the Hot Chocolate Band? The Radha Krishna Temple? David Peel? Join us for a tour of Apple odds and sods and let us know your thoughts on the episode on Facebook, Twitter, or by email (ivegotabeatlespodcast@hotmail.com). Here is our review of Paul McCartney's new album Egypt Station that came out on September 7. We discuss the background of the album, and give track-by-track analysis of each song. Share your own thoughts about the album on our Facebook page, Twitter, or by email (ivegotabeatlespodcast@hotmail.com). 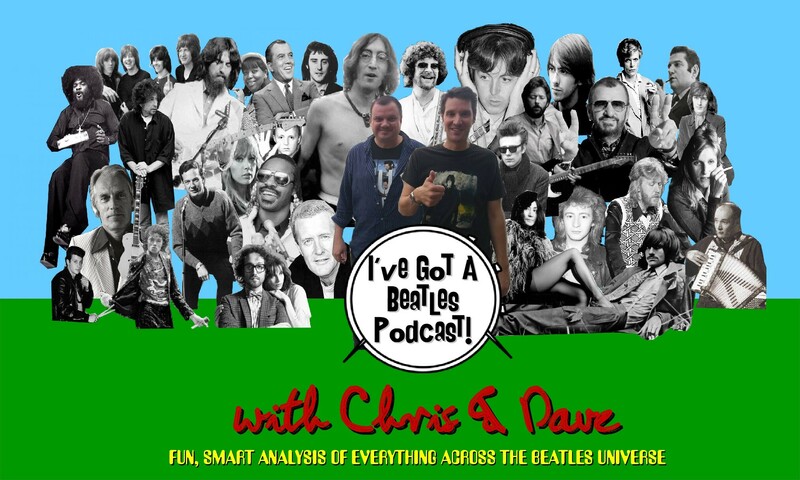 In this episode, Dave interviews Dr. Jan (Honza) Blüml, a professor of musicology at Palacky University in Olomouc, Czech Republic about the Beatles behind the Iron Curtain. Dr. Blüml is an expert on popular music and communism, and shares his insights about how people heard the Beatles' music, what they thought of it, and the cultural impact of the group during communism. Enjoy this episode on a fascinating topic! Episode 122: And on Guitar…John Lennon! In this episode we examine the many different styles and techniques of John Lennon's (often-overlooked) guitar playing. We discuss topics like his rhythm guitar playing, his fingerpicking, and his "raw" feel as a guitarist. Share your own selections with us on our Facebook page or via email. To commemorate the 50th anniversary of the film Yellow Submarine, as well as its reappearance in theaters, this episode looks at the iconic animated Beatles classic. We discuss the plot, songs, characters, as well as how it holds up 50 years later. Enjoy this bonus episode of Dave discussing a performance he heard of Paul McCartney's 2001/2006 classical piece Ecce Cor Meum in the Czech Republic on 6/17/18 (one day before Paul's birthday!). He shares some thoughts on Paul as a classical composer in general, and concludes with an excerpt from the piece. In this episode, we talk about our most desired Beatles and solo releases. Some of these are fan favorites like the movie Let It Be and the Shea Stadium Concert, but we also have many other suggestions as well. Be sure to share your own on our Facebook page, on Twitter, or by email (ivegotabeatlespodcast@hotmail.com). In this episode we step back and look at Ringo Starr's entire life and musical career in honor of his recent knighting. We discuss some of his key contributions to the Beatles, and then launch into a survey of his solo career up to the present day. You'll also hear a fun example of his TV work in the 1980s, and a clip from his 2015 Rock and Roll Hall of Fame induction ceremony. Congratulations to Sir Ringo! For this episode, we asked our listeners on Facebook to tell us a song that "defines" Paul McCartney as an artist, performer, musician, etc., and give their reasons why. In this episode, hear the selections along with commentary from listeners and Dave and Chris. There are many familiar choices, but there are a few more obscure tunes that present another side that "defines" McCartney. This episode digs into the song "Revolution 1" and the single "Revolution." We discuss the differences between the two versions, provide musical and lyrical analysis, and of course, play several cover songs of this iconic tune written 50 years ago. In this second installment about Beatles-related films, we examine Martin Scorsese's 2011 film "George Harrison: Living In The Material World," now showing on Netflix. We share our thoughts about the movie's main thrust, as well as discuss many discoveries and stories told in the film. In this episode, we dissect the early John Lennon song "I Call Your Name," which never found a happy home in the Beatles catalog (it was put on an EP, then a B-side, etc.). We discuss some interesting instrumental and musical features about the song, and as always, play you a variety of unique cover songs. Enjoy! In this episode we review and discuss Dhani Harrison's new album "In Parallel." Dave and Chris both give it a thumbs up and argue that Dhani's first solo album is well worth a listen. Join us as we review Ringo's new album Give More Love. We talk about the best tracks, the numerous players on the album (including Sir Paul) and some of the more interesting lyrics on the album. We recommend giving it a listen! In this episode we discuss the Apple career of Mary Hopkin, signed to Apple Records by Paul McCartney and singer of a couple of hits including "Those Were The Days." We discuss her first Apple album produced by McCartney called Postcard, as well as her Tony Visconti-produced second Apple album, Earth Song/Ocean Song. Join us as we dig into George Harrison's last "Indian" Beatles song from 1968, "The Inner Light." We discuss the music, lyrics, and as always, scrounge up a few rare cover versions. Dave interviews four fellow presenters at the "Summit of Creativity: Sgt. Pepper's 50th Anniversary" conference at the University of Michigan at Ann Arbor on June 2, 2017. Dave talks to Aviv Kammay, Katie Kapurch, Kit O'Toole, and Aaron Krerowicz about what Sgt. Pepper means to them, as well as other topics. Episode 100: IGABP at 100! Take a stroll down memory lane with us as we share a retrospective of our first 100 episodes with highlights, notable audio clips, some funny moments, and more. Thanks so much for your continued support, and enjoy this look back! Episode 99: Macca’s Remastered Flowers in the Dirt Review! In this episode we weigh in on the new Paul McCartney reissue of his 1989 album Flowers in the Dirt. We'll take you through the original album, as well as discuss the bonus tracks with Elvis Costello. Enjoy!